I just found out in an email of all things, what a way to hear. 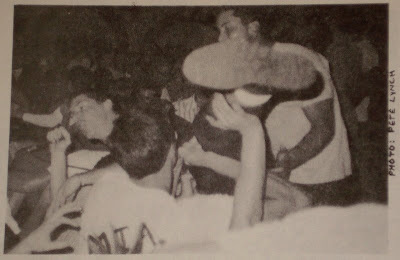 Mike Conley, wheelie king, frontman for the punk band MIA, owner of the popular Avalon Bar in Costa Mesa, father of three, and genuine nice guy died this morning. I have no other details as of now but I will post them as I hear. Please keep his family in your prayers! 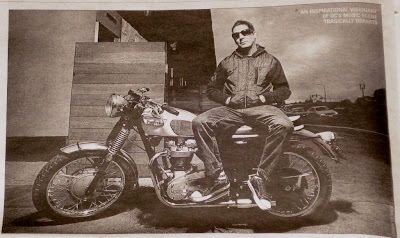 Photo from OC Weekly article. It only seemed like yesterday that I saw Mike at Meatball's movie premier. I didn't even get the chance to say "Hi." Life is so unpredictable that way though and weeks before we were eating with friends and chatting it up at Crab Cooker in Newport and then Taco Mesa in Costa Mesa, Mike's favorite restaurant. Mike was always so polite, so easygoing. 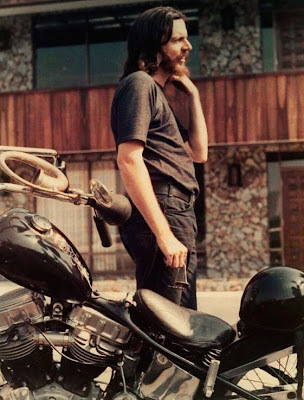 He would always say, "How's it going Slim?" or "Man I haven't seen you in a while...what are you up to?". Mike always cared for those around him and will be sorely missed. My sincerest condolences go out to his wife and three daughters at this time of loss! 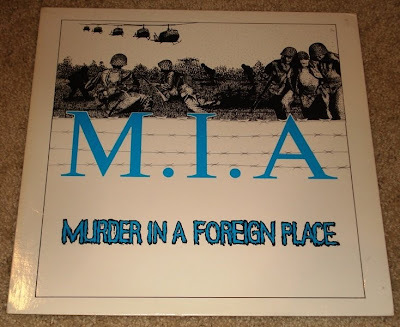 MIA "Murder in a Foreign Place" second pressing with blue letters and back cover. 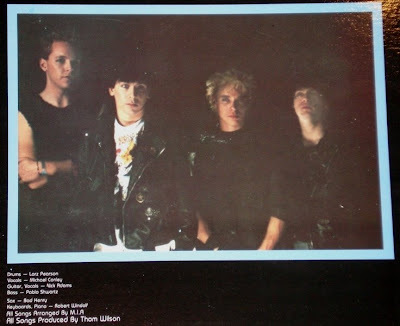 1st pressing was red! 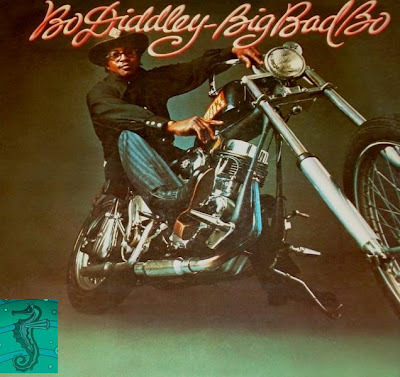 Such a great album! Mike you will be missed dearly! Mike, you will be deeply missed, but never forgotten! In honor of Mike Conley's life please send me your best photos so I can post them here. Anything will do but something current would be nice! 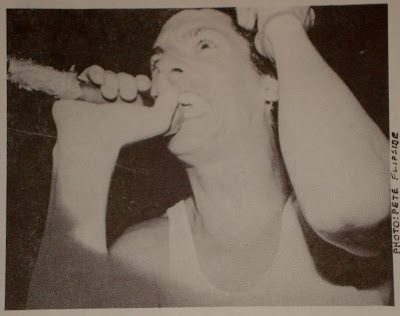 Also, no new posts will go up until Monday 03/03/08 except for those related to MIKE! If anybody needs someone to talk to or pray with about Mike's loss don't hesitate to call or write! 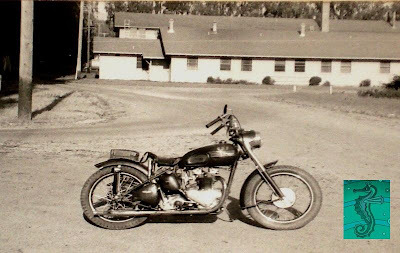 Nice pre-unit mild custom from an old black & white photograph found on Ebay! 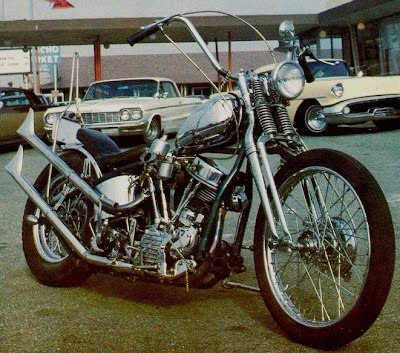 Cool old chopper postcard from Ebay! 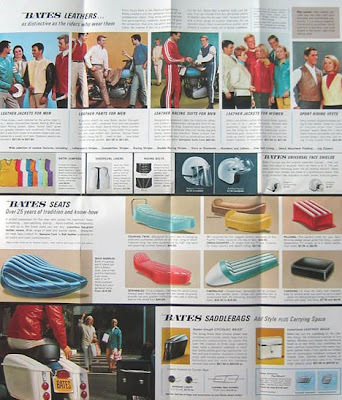 I think I saw the ribbed / pleated seats in an old 60s motorcycle magazine selling for $29.95. Its crazy what they're selling for nowadays on Ebay! How about that red & white p-pad? So cool! 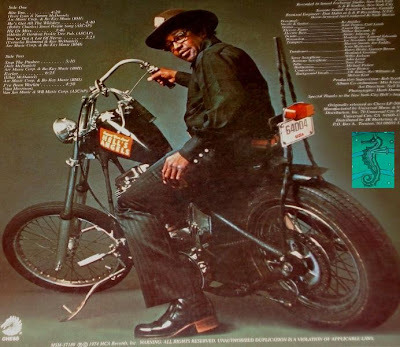 Mufflers, mirrors, and saddlebags; not to mention the best leathers from back in the day in my opinion. 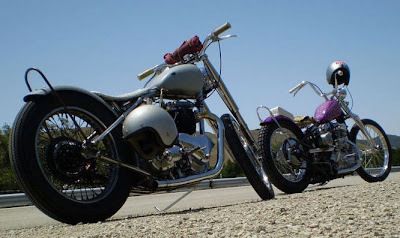 Bates of California definitely made some cool cycle supplies! 60s Bates garment tag. I love the script letters and racing flags on tag! 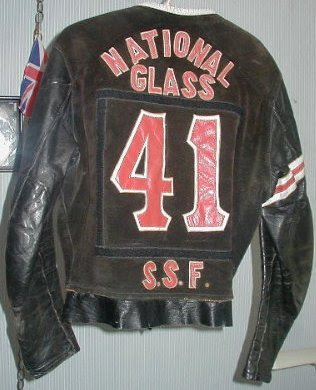 The back of an old ABC Leathers jacket I used to own and wear while riding my 1956 T-110 Triumph. 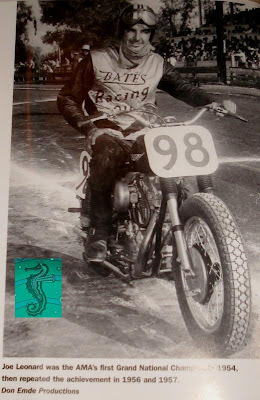 Bates bought ABC Leathers in the late 60s. 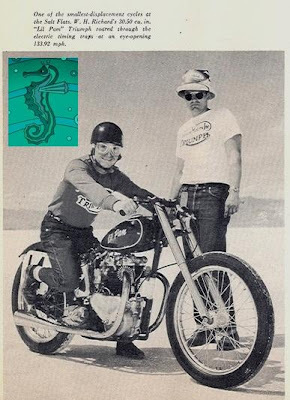 Cool picture from a Bates photo ad in a mid 60s Cycle Guide magazine. 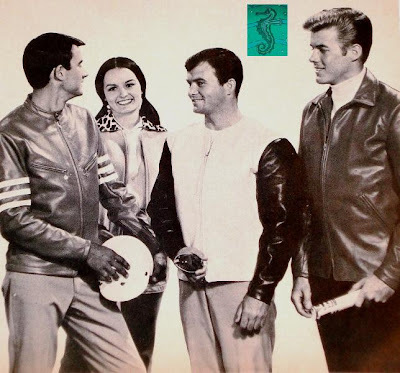 Thats interesting how the girl has a leopard collar on her jacket. I've never seen that before on a Bates! Interesting! 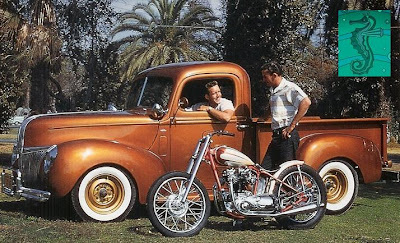 Check out this flawless pre-unit and matching 41' Ford pickup truck! 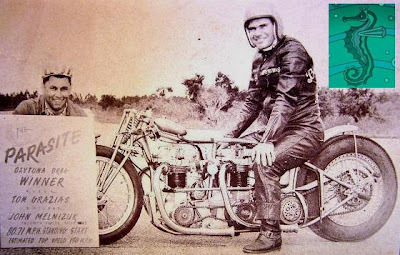 I'm not sure of the origin of this photo but it comes from my friend downunder in Australia. Thanks again Rene! 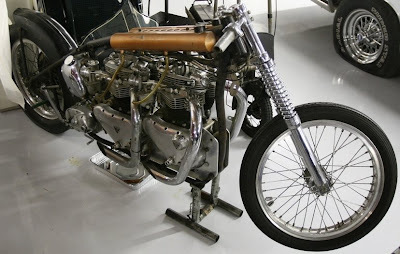 Cool twin engine triumph pre-unit drag bike from Mullin's Chaindrive website! 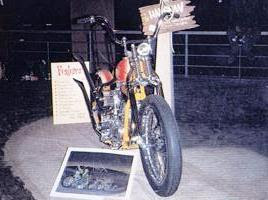 The "Parasite" Daytona Drag bike with estimated top speed of 150 mph from a JJ Post! Check out the smallest peanut tank in the world along with some of the best flared trumpet tips I've ever seen! 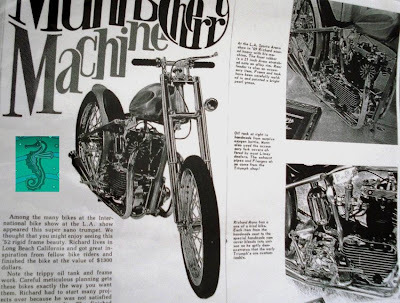 Obviously not a twin engine bike but this magazine from ebay caught my eye. 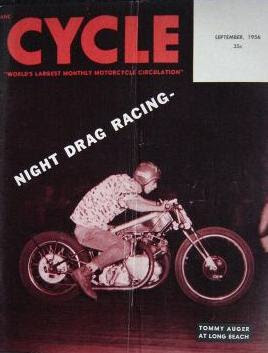 Night drags and a Vincent drag bike on the cover from September 1956! 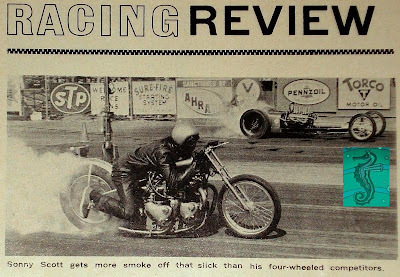 I'm going to have to find a copy of this issue! 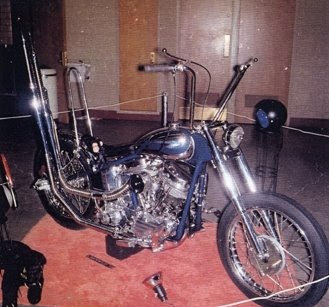 Sorry for the chessy alliteration title but I thought this bike was cool. 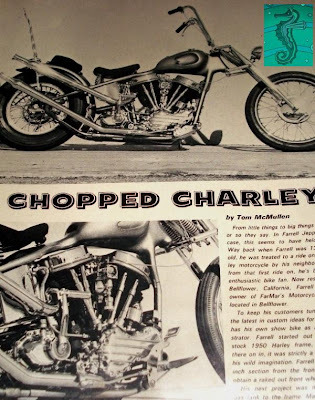 The pictures comes from an article about some miniature chop but that was not of interest so I cropped it out. 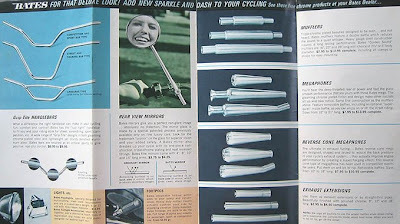 I recall the article was from a late 60s Cycle Guide. 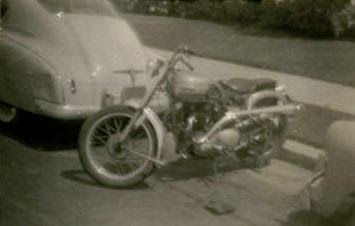 Anybody who knows the story on this bike please fill me in. 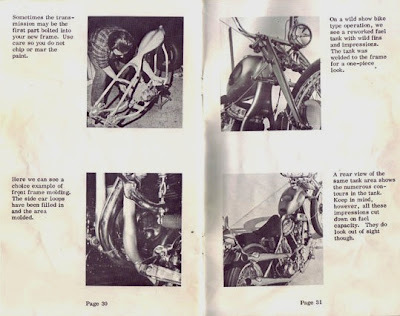 I'm also looking for a picture of the whole bike or at different angles! Thanks! 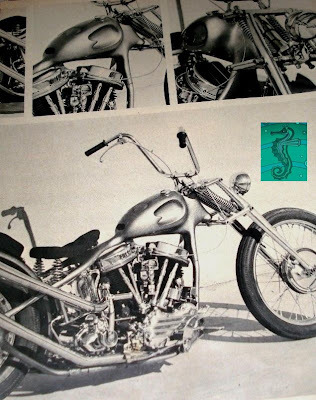 How's the large "Support Your Local Hell's Angels" sticker on Bo's tank. 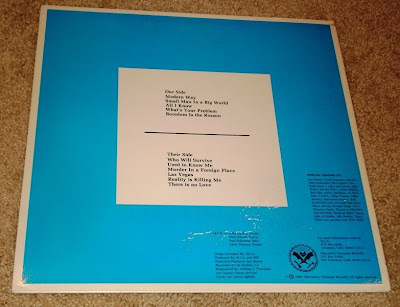 Album is from 1974! Check out the sherrif's badge being used as his gas cap. Nice touch! 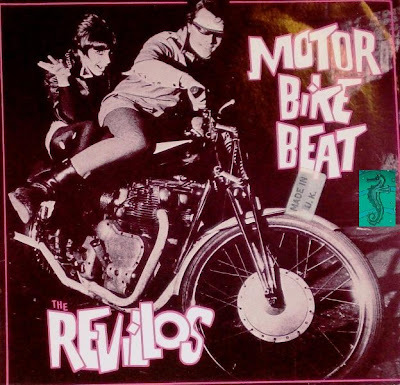 Revillos "Motor Bike Beat" 7-inch. 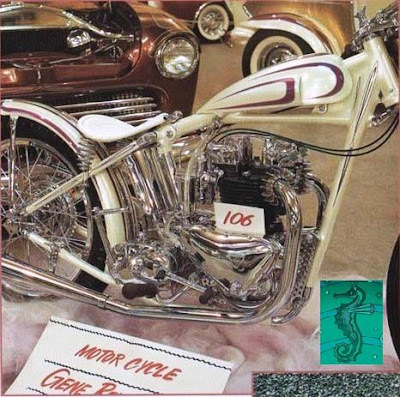 Nice Royal Enfield chop on this cool cover! Great song as well! 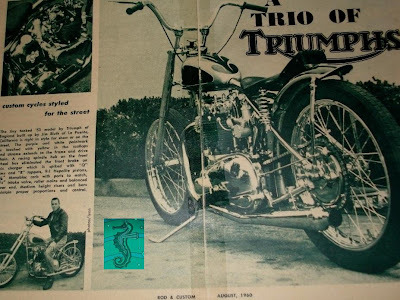 Though this article boasts three triumphs, the third is a bone stocker and is not so interesting. 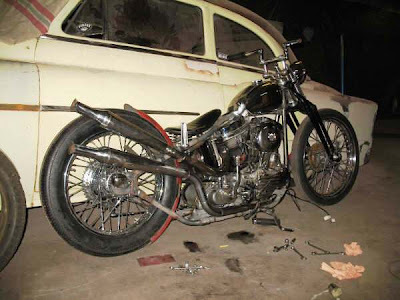 This beauty however is ruling with the square U-shaped Flanders risers, Q-racing cams, and the nice sea-flamed tank. 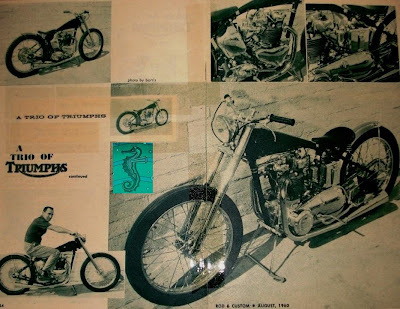 I think Scott Craig must have used this bike as a template when he painted the tangerine triumph Yoshi now owns. 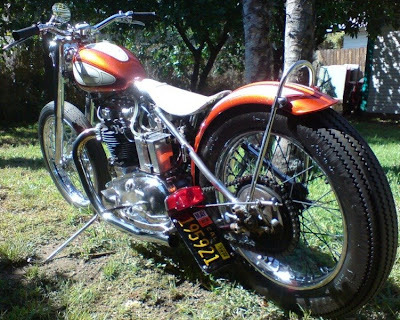 Scott's old tangerine triumph for tank comparison. 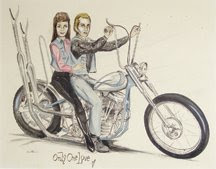 Picture from old Greasy Kulture website. 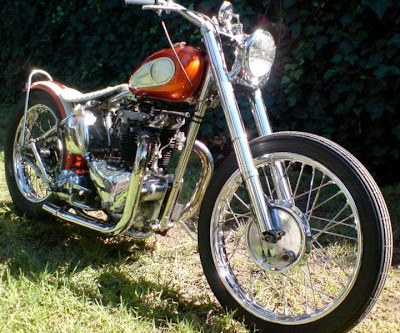 A very nice 1954 rigid triumph! 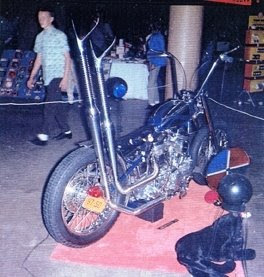 This was a one year only bike with alternator option I believe and a special primary cover, as seen here! Cool minimalist tank and long angled racing cones as well! 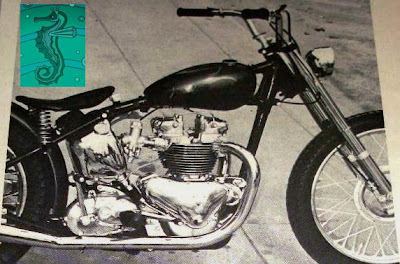 This bike is so cool with the rare Award Cycle finned timing cover, the oxygen bottle oil bag, the contoured seat, and the sectioned tank. 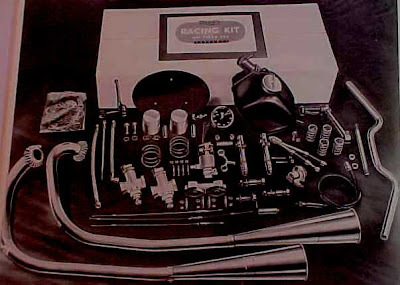 This has to be one of my top five favorite pre-units of all time. 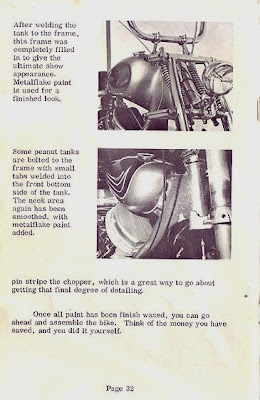 Article came from Gabe's old Roth Chopper Mag from the early 70s. 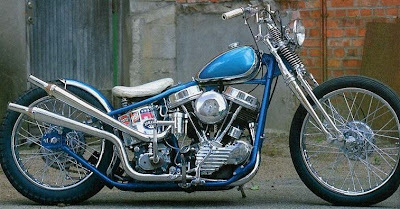 I love the pipes on this panhead as it appears to be one upsweep and one shotgun with an angle to it. Very cool! 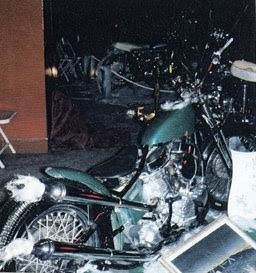 This photo and the one below were posted by Nikki on Choppers and Punk Rock a while back. 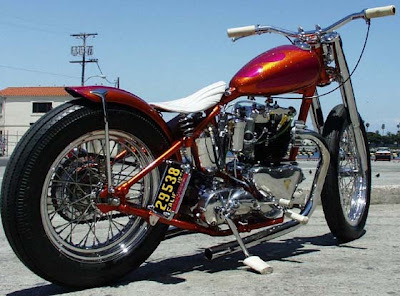 The chromed tank is super cool as well as the low stance. Check out the current issue of DiCE magazine for the complete story! 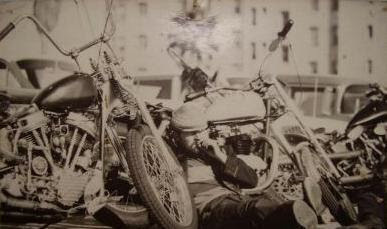 I don't know anything about this bike but this shot was from a 1953 Motorama brochure posted on Jockey Journal a while ago. 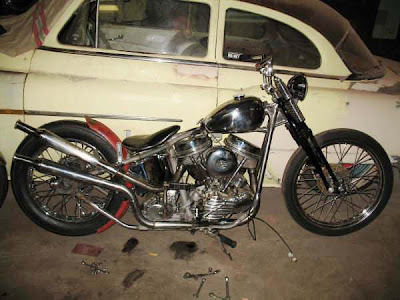 Picture of the same bike with different paintjob from an Ebay listing. 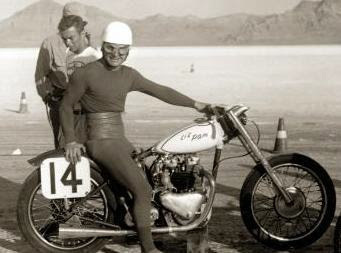 The Lil' Pam triumph was most likely running this rare T-100 race kit. Picture comes from a JJ post. 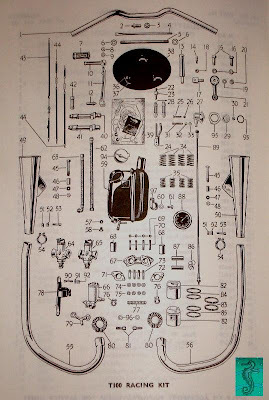 Here's a better look at the kit from a late 50s / early 60s Triumph Replacement Parts manual!